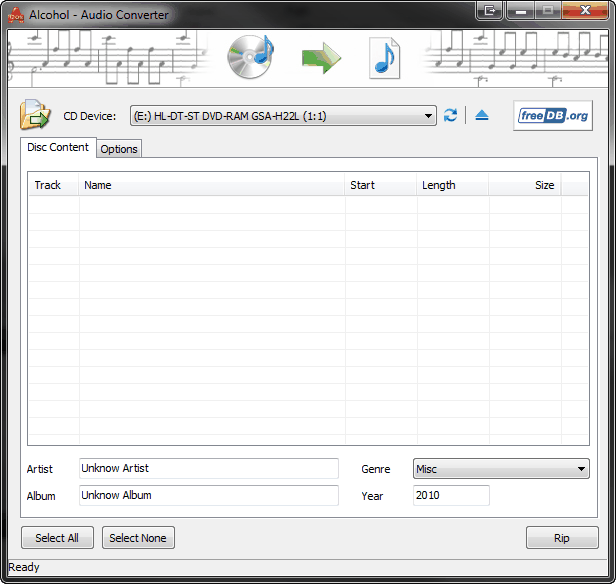 CD Device - here you can choose which device to use to read your disk. Refresh - allows you to refresh the drive. Open/Close - allows you to open or close the drive of your choice. FreeDB.org - allows you to manually connect to FreeDB.orgs Database. Disc Content - these are only accessible with a disk in the drive. Track/Name/Start/Length/Size - show information for the track. Artist - shows the name of the Artist this can also be manually edited. Album - shows the name of the Album this can also be manually edited. Genre - allows you to manually choose the Tracks genre using a drop down menu. Year - Shows the year for the Track(s) either from the FreeDB.org Database or can be manually edited. 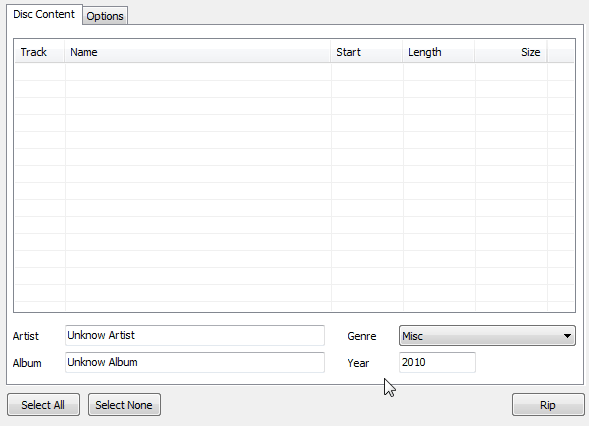 Select None - allows you to deselect selected tracks. Rip - allows you to read the contents of the disk to your Computer. Output folder - allows you to choose where you wish to save the ripped tracks. 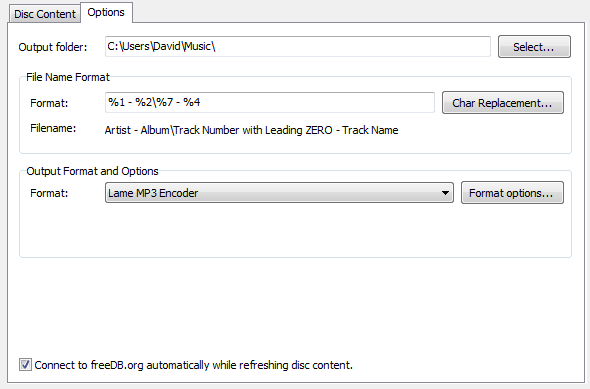 Output Format and Options - allows you to choose the Encoder that you wish to use and to edit the settings by clicking on Format Options. Connect to FreeDB.org automatically while refreshing content - allows you to choose whether or not to connect to FreeDB.orgs Database when the disk is refreshed.